LAS VEGAS, NV – June 20, 2013 – LaunchKey, a secure approach to sign on or authenticate without passwords by using a multi-factor authentication process on a smartphone or tablet, launched its private beta in May and plans to launch its public beta on July 1. During the private beta, hosted at the Switch SUPERNAP, LaunchKey invited a select group of developers and web site managers to implement and test their solution. During the public beta, the application will be available to all developers for integration into websites and mobile applications, providing users with a trustworthy alternative to access these sites with a single sign on and without reliance upon personally identifiable information. LaunchKey was established in July 2012 at Startup Weekend Las Vegas at The Rob Roy inNEVation Center, where the founders won first place and the award for best design. 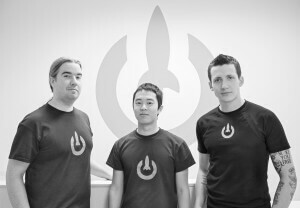 The company was co-founded by Geoff Sanders, Yo Sub Kwon and Devin Egan, and is focused on supporting consumer and enterprise markets, and built to meet government security regulations and compliances. LaunchKey will offer the application in the Apple App Store and Google Play on July 1. LaunchKey built their cloud-based infrastructure on the Joyent Cloud, hosted by Switch, the developer of the renowned SUPERNAPS. This Virtual Private Network provides the highest levels of security and is scalable in real time – critical factors for application development and testing. The SUPERNAPS are the largest, best-designed technology ecosystems in the world. LaunchKey is currently in the process of negotiating partnerships with leading technology providers, with plans to announce these partnerships later this summer. For more information, or to sign up for the public beta after the July 1 launch, visit launchkey.com. A recognized world leader in colocation design, development and mission critical operations. Copyright © 2019 Switch. All Rights Reserved.